Retailers are getting ready to report third-quarter earnings. They've been releasing negative guidance and have announced numerous store closings. This has us wondering: which retailers might be better set up for the long haul? 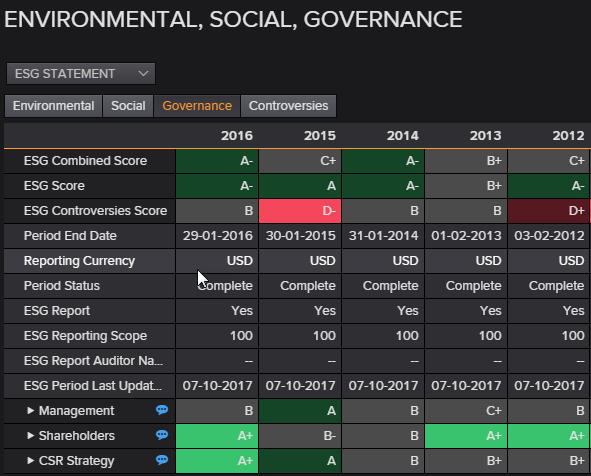 To evaluate the long-term health of companies in a more holistic way, we turn to Thomson Reuters' Environmental, Social, Governance (ESG) data. This allows us to consider both financial and business sustainability dimensions to evaluate retail companies with superior business characteristics, including management, culture and risk profile. 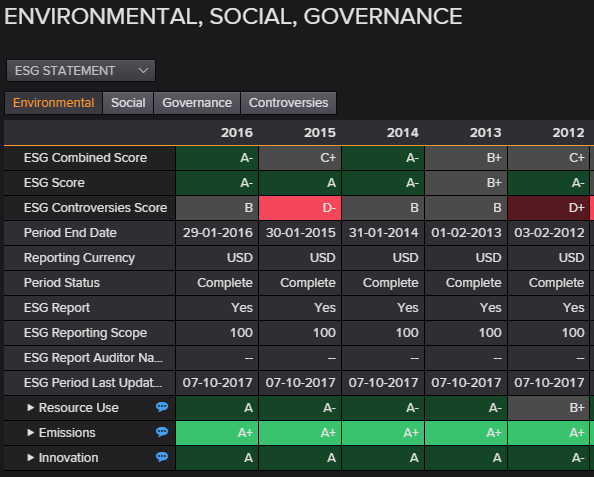 The Thomson Reuters ESG Combined score provides a rounded and comprehensive evaluation of companies' ESG performance based on reported data in the public domain across ten different ESG topics (including emissions, environmental product innovation, human rights, shareholders, etc.) and discounting for ESG controversies captured from global media sources. 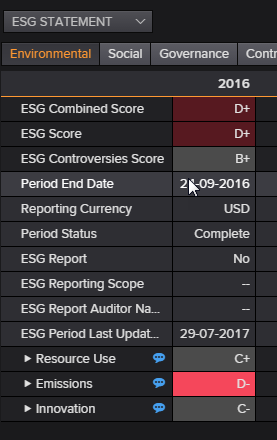 We used the Thomson Reuters Eikon Screener application to pull the ESG Combined scores for the companies in our Thomson Reuters Retail and Restaurant Earnings Index, which include S&P 1500 companies that fall under the consumer discretionary and consumer staples sub-industries. We looked at the overall ESG Combined score calculated per retailer for the current fiscal year in the model. All scores are relative percentile rank score, where 100 is considered the best score and zero the worst. The companies below meet positive standards of corporate responsibility and are better managed. Therefore, they are also better at anticipating and mitigating risk. A few standouts include Lowe's (NYSE:LOW), TJX Companies (NYSE:TJX) and Coach (COH), which are companies that have been performing well during the latest retail apocalypse. 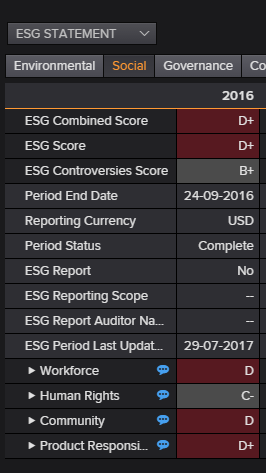 On the flip side, below are the companies with the weakest ESG Combined score. These companies are less vocal and transparent when it comes to social responsibility, company culture and management. Ingles Markets (NASDAQ:IMKTA), a supermarket chain in the southeast United States, has the weakest ESG score in our retail universe. The environmental principle includes the retailer's use of resources, emissions and product innovation, including reduction of energy and water use, waste, pollution, etc. Moreover, it evaluates environmental risks that might affect a company's income, and how the company is managing those risks. Lowe's boasts an A+ in its emissions score, which reflects the company's commitment and ability to reduce air, water and waste emissions (Exhibit 3). The company recycles and reuses nearly 400,000 tons of waste. It also incorporated and upgraded energy efficiency measures to optimize energy consumption in its retail locations. Other standouts among the winners include TJX Companies, Inc., which discloses its policy to improve emission reduction by over 50,000 metric tons of carbon dioxide equivalents (CO2e) and saved the company an estimated $15 million over the past five years. Renewable energy has also been an increasingly important part of its environmental sustainability strategy in reducing GHG emissions from electricity consumption. Meanwhile, Ingles Markets Inc. scores an anemic D- in its emissions category, as it fails to report on its emissions policy, biodiversity impact reduction and other environmental restoration initiatives (Exhibit 4). Similarly, Installed Building Products, Inc. (NYSE:IBP) scores a D in its innovation category and lacks any reporting across the three environmental categories. The Social principle includes workforce factors, human rights, diversity and inclusion, and product responsibility. Moreover, it evaluates relationships with other suppliers and their ESG impacts. It also looks at community involvement, such as volunteer work and donations. Lowe's boasts an A+ for both its Community and Product Responsibility involvement. The retailer has a code of conduct that indicates it strives to be a fair competitor and avoid bribery and corruption at all of its operations (Exhibit 5). Meanwhile, apparel retailer PVH Corp. (NYSE:PVH) scores an A+ for disclosing its human rights policy, including guidelines against the use of child labor. On the other hand, Ingles Markets Inc. has a weak D score among various categories, including workforce, community and product responsibility. The company doesn't have a policy to improve its employees' health and safety within the company and its supply chain, among other similar factors. Moreover, it doesn't describe in the code of conduct that it strives to be a fair competitor, nor does it have a customer health and safety policy. Similarly, Sally Beauty Holdings Inc. (NYSE:SBH) and Liberty TripAdvisor Holdings, Inc. (NASDAQ:LTRPA) score a D and D- for failing to describe in its code of conduct that it strives to be a fair competitor and avoid bribery and corruption in all its operations. The Governance principle looks at the retailer's management, shareholders and corporate social responsibility (CSR) strategy to ensure shareholders are voting on key topics, while avoiding personal interests. Lowe's boasts an A+ for its shareholders' involvement, ensuring equal treatment of minority shareholders via the "one share, one vote" policy, giving many important voting rights to the shareholders, including vote on executive pay, among other best governance practices (Exhibit 7). Beauty retailer Estee Lauder Companies, Inc. (NYSE:EL) scores an A+ in this category for having and engaging with its CSR Sustainability committee to guide the company in setting measurable sustainability goals aligned with its values and position. On the contrary, two of the board members at Ingles Markets Inc. are brother and sister. Based on their combined voting power, the company meets the definition of a controlled company for purposes of the Nasdaq corporate governance rules. As a result, the supermarket is exempt from certain of its corporate governance requirements, including the requirement that a majority of the board members be independent directors (Exhibit 8). Similarly, Biglari Holdings Inc. (NYSE:BH-OLD) scores a D- in its management category for not having a policy in place that maintains effective board functions and gender diversity of its board. 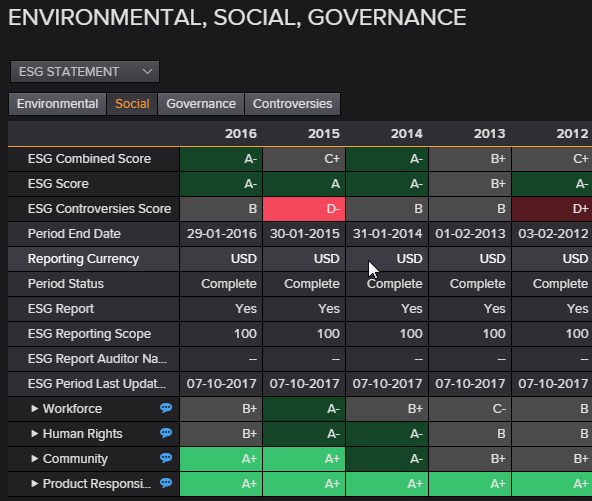 The ESG data allows us to see which retailers practice business with the belief that business financial success and social well-being are interdependent, and that the long-term interests of the organization and its stakeholders are best served by improving its environmental, social and governance practices. In this scenario, the correlation between earnings returns and ESG factors is evident. Not only does Lowe's possess the strongest ESG score in our retail universe, but it has been one of the strongest financial performers for some time. The retailer has posted 18 straight quarters of double-digit earnings growth, and is expected to continue to do so in the current quarter, with a 16.4% estimate earnings growth rate (Exhibit 9). Conversely, Ingles Markets Inc. is on track to report its second consecutive year of negative earnings. According to StarMine models, the stock might be a value trap. It appears cheap but has some credit difficulties, and the Price Momentum Model suggests negative stock price momentum (Exhibit 10). 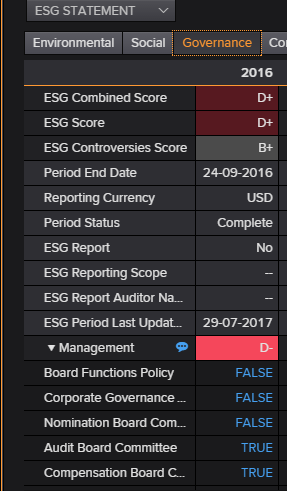 Thus, both its financials and ESG structure could use some improvement.